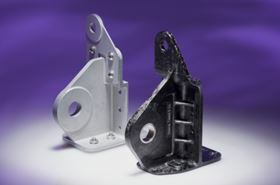 Xycomp DLF can produce complex-shaped composite parts. The development project was performed under the R&D umbrella of CORAC (Council for Civil Aeronautics Research), which supports efforts focused on preservation of the environment and sustainable development in the aviation sector. The project included material characterisation of Xycomp® DLF®, a Greene, Tweed discontinuous long fibre thermoplastic material, part sizing, and part testing by Aerolia under various conditions to achieve desired technology readiness levels (TRL) for production applications. Several different thermoplastic resin families are utilised in the Xycomp product line, including PEI, PEEK and PEKK, together with either carbon or glass reinforcement fibres in a variety of product forms. Production applications for major aircraft platforms are currently under investigation. According to Vincent Labatut, R&T and Stress Engineer, new composite-intensive aircraft continue to include a lot of machined metallic components because cost-effective complex-shape composites solutions are not available. Xycomp DLF is able to provide complex-shaped composite parts with part count and weight reduction advantages over simple loaded metal parts, bridging the gap between complex machined metal components and cost-intensive continuous fibre composite lay-up technologies. Smith Metals Products says that it has added titanium metal injection molding (TiMIM) capabilities to its MIM range.